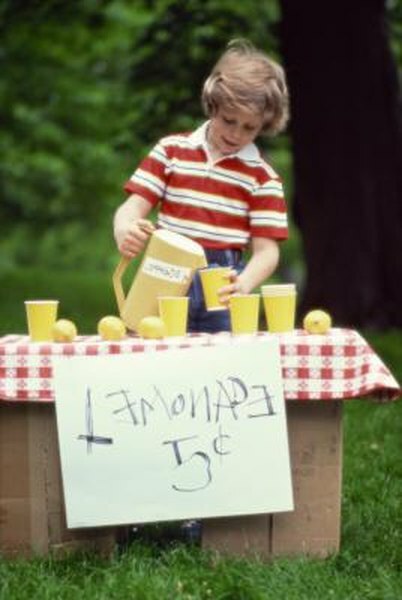 Teaching your child business sense when he is young can inspire entrepreneurship. 1. Do I Have to Itemize for a Childcare Deduction? 2. Do I Have to Pay Taxes on Money My Parent Gave Me? Teaching your children how to handle money is a good thing. Guiding them in principals of saving and investing is even better. You might go so far as to help set your child up in business. While certain types of investments in your own business can give you a tax write-off, in most cases, gifts to your child's business are not tax deductible. You might help your teenage son set up his own lawn-mowing business by purchasing a new mower only for his mowing-business needs. Your adult daughter might need money for living expenses while she gets her consulting practice off the ground. The Internal Revenue Service considers any money you give to your child that you do not expect to be repaid and does not provide you with equity in your child's business, to be a gift. Gifts are typically not considered income to the recipient, nor are they deductible for the donor. In addition to not being tax deductible, if your gift is too large it might be subject to the federal gift tax. Gift taxes are the responsibility of the giver, not the receiver. As of January 1, 2013, you could exclude up to $14,000 per year in gifts to your child. Your spouse could also give up to $14,000, so together you could give your child up to $28,000 per year to go toward her business without incurring gift taxes. You might be able to write off money you put into your child's business, provided your child treats that money as an investment in the business rather than a gift. If you are a partner in your child's business, and you use the money to buy capital equipment or to fund operating expenses, you can deduct some of those costs as a business expense on Schedule C.
If your child's business is set up and operated only for charitable, religious, scientific, literary, or educational purposes, it might qualify as a charitable organization for federal income tax purposes. Gifts to qualifying organizations are tax deductible, provided the gift is to the organization and not to your child. You'll have to itemize your deductions rather than claiming the standard deduction if you want to take this write-off. If You Gave Money to Someone Can It Be Deducted Off Taxes? Can a Parent Buy Stocks for a Child?